This article was submitted by Dan Bottom, a current Howard L. McKee Ecology Resident at Sitka. Dan is a fishery research biologist who worked in state and federal government for 38 years, including 22 years with the Oregon Department of Fish and Wildlife in Corvallis and 16 years with the National Oceanic and Atmospheric Administration in Newport, Oregon. His research interests include salmon, estuaries, and environmental history. He helped to initiate a long-term study of the effects of wetland restoration on salmon populations in the Salmon River estuary, right in Sitka's backyard. Dan retired from federal service in 2016 but continues serving as Courtesy Faculty at Oregon State University and as a technical advisor for a large habitat restoration program in the Columbia River estuary. I am wary of all descriptions that begin, "Most salmon..." "Most" is so often deceptive. Without fanfare or qualification, it strips away all the outliers and reduces salmonness to any trait found in the greatest frequency or number. With no point of reference, "most" begs many questions: "most since when?" "most where?" "how often most?" etc. "Most" declares the standard for ignoring all other possibilities that a lesser salmon might otherwise achieve-possibilities that become all the more important when "most" is no longer very many, and "none" is the overriding concern. The recovery of diminished Pacific Northwest salmon stocks requires attention to much more than "most." Our Salmon River Study began by searching for all the salmon "others." Most, but not all, fall-run Chinook Salmon on the Oregon coast rear in estuaries before migrating to sea, where they feed and grow and later return to their home streams to spawn. What most Chinook Salmon do to complete one life stage, however, may or may not predict their likely success negotiating the next. Paul Reimer's classic study in a small basin on the southern Oregon coast (Sixes River), for example, identified five alternative rearing and migratory pathways or juvenile "life histories" within the same Chinook Salmon population. Most juveniles leaving Sixes River followed what Paul classified as pathway Type 2- rear in freshwater until mid-summer, stay in the estuary for a few weeks, and migrate to the ocean by late summer. However, most adults (90%) were the survivors of pathway Type 3-rear in freshwater until mid-summer, remain in the estuary up to several months, and enter the ocean in the fall. In this case, most juveniles (Type 2) accounted for less than 3% of the returning adults, whereas most returning adults were the survivors of a smaller number of late ocean migrants (Type 3). The Sixes River research can be credited for demonstrating that estuaries are important environments for the growth, survival, and return of many adult Chinook salmon. However, it also revealed how incredibly variable salmon life histories can be- even within a single population in one tiny watershed- and why we should never discount the outliers. Recently biologists have coined the term "portfolio effect" to describe the contribution of genetic and life-history diversity to salmon persistence. Salmon hedge their bets against population extinction in unpredictable environments by spreading their risks. Juvenile salmon are flexible. Individuals in a population may choose different migration routes and schedules to make the difficult life-cycle transitions from gravel bed to stream, stream to river, river to estuary, estuary to ocean, and back again. No one route and schedule can ensure survival against every possible contingency that population members might face at any time along the way- disease, predators, drought, flood, landslide, El Nino. Each year brings its own set of contingencies. Each year a mere fraction of the several thousand eggs deposited by each female salmon will survive to adulthood. A diversity of life-history pathways makes it more likely that at least some-but certainly not most-individuals in the population will survive to continue the next generation. The diversity of habitats throughout a river basin determines the number of life-history pathways potentially available to young salmon. Removing most habitat in an estuary, for example, could eliminate pathways that involve extended periods of estuary rearing- the Type 2 and Type 3 life histories of Sixes River Chinook Salmon, for example. ‍1. Beach seining at the Salmon River mouth to estimate the timing and sizes of juvenile salmon at ocean entry. 2. A trapnet used to capture salmon and other fish in the Salmon River tidal marshes. Fish were collected in a live box as each channel drained with the outgoing tide. 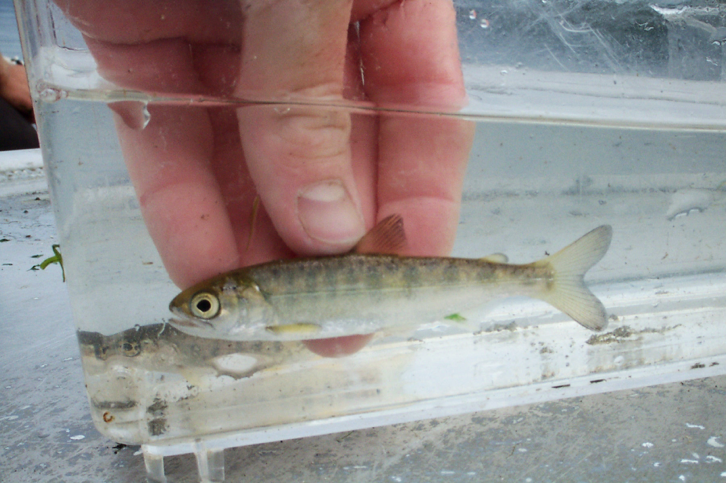 When our research team initiated the Salmon River Study in the late 1990s we weren't surprised to find juvenile Chinook Salmon in the restored tidal marshes. We already knew that estuary-migrating juveniles often seek shallow, off-channel habitats to rear. Still, we couldn't help but wonder whether the long-term effort to restore the estuary's wetlands had made any difference to the population as a whole. Did reconnecting estuarine marshes establish new (or re-establish old) life-history pathways in the population? Did any of those juveniles in the restored marshes actually survive to contribute to the next generation? The Oregon Department of Fish and Wildlife conducted surveys in the Salmon River estuary in 1975 - 1977 when the tidal marshes were fully diked. At that time, most juvenile Chinook Salmon reared upriver for many months. Few entered the estuary before July, and estuary abundance peaked and declined a month or two thereafter. In contrast during our 2000-2002 surveys, many juveniles entered the estuary at smaller sizes earlier in the spring (April - June); occupied the restored marsh-channel habitats through August; and migrated to the ocean over a much wider range of sizes and times. We classified four generalized life-history pathways, including two early migrant types that were rare or absent during the 1970s surveys: fry migrants (an inch or two in length) move into estuary wetlands soon after emerging from the gravel, and larger fingerlings (two to three inches in length) rear upriver for a few weeks or months before entering tidal-marsh channels in April or May. Survivors of each of the juvenile life-history pathways contributed to adult returns, many tracing previously inaccessible routes through the tidal marshes. Three of the four pathways involved weeks or months of estuary rearing. As many as three quarters of the returning adults that survived to spawn in the Salmon River had spent >30 days feeding in the estuary, usually in the restored wetland channels. Diversity of the Salmon River population was simplified when wetland diking eliminated the number of life-history pathways available in the estuary to young salmon. Now most, but not all, juveniles rear in the estuary, and most, but not all, returning adults are the survivors of estuary-resident juveniles. Restoring tidal wetlands alone may not be enough to ensure resilience of this one small population in a rapidly changing climate. Those pathways now chosen by "most salmon" may one day become the routes of mere outliers, and vice versa. Yet I feel better knowing that restoration has expanded the life-history possibilities and extended the range of outliers. Such diversity only increases the likelihood that at least some individuals will survive in a shifting aquatic environment.